Smoldering Wizard's Old-School Gaming Forums • View topic - The nine Druid mysteries? The nine mysteries, are they more than just titles? 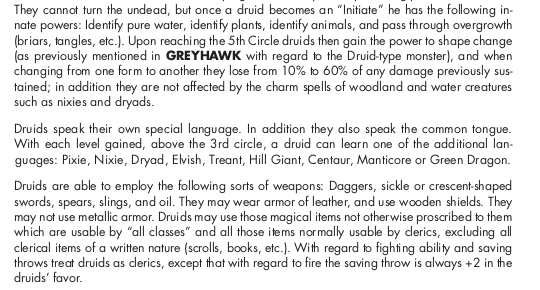 Surley they must be, since the rules state that the Druid 'learns' the first Mysteries at second level, and then goes on to describe the new abilities (not just spells!). But that's the only description of Mysteries that I've found, and there are eight more. I know about the fifth level abilites, and the stronghold, and I know about the challenges to become Arch, and Grand Druid. Is there info somewhere that details the mysteries? Maybe a supplement? Or is this something that a GM should flesh out? Or, do they literally just become titles? Re: The nine Druid mysteries? Ah, I see. I definitely don't have that supplement. I really should have known! Thank you so much for the thorough reply, and the welcome! The OD&D PDFs are available legally now, at dndclassics.com, highly recommended reading. It occurs to me also that you have a good idea, I like Druids but always felt they were a bit under-powered as far as spell choices (even given the relatively low XP requirements), perhaps expanding the class by way of more Druid mysteries would help. Looks like I've got a new reading assignment! Thanks, again. It's funny, I've been so into Swords and Wizardry lately, that I forget it's a 'retroclone'. It feels unique. The support content from Bill Webb and company is so good, that I honestly don't care to play any other game. 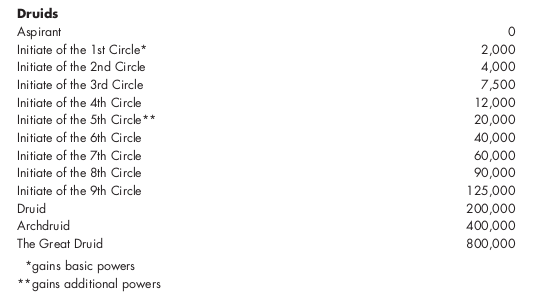 I guess I kind of assumed that somewhere in one of those materials, they rounded out the Druid class a little bit. Even though, I know they can't really deviate too much from the original inspiration. Still, an awesome class when played with a little creativity, though.